Digital image of view of Leith Bourse. 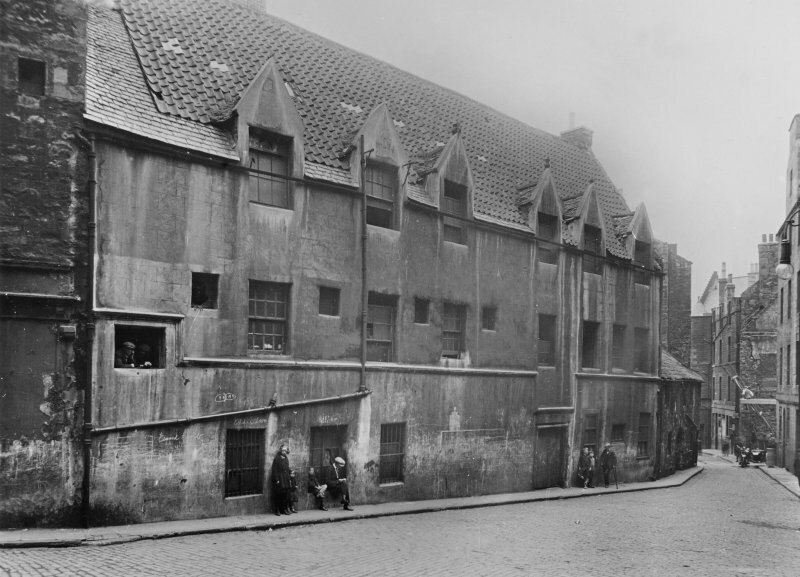 In the early years of the 17th century, Bernard Lindsay had the idea of improving the amenities of Leith by building a notable portico, wherein merchants might promenade and trasact their business, beside his house which adjoined the King's Wark. This portico was evidently a paved piazza of polished stone columns and arches, provided with benches and seats. He was rewarded for his action by the king in 1612 (RCAHMS 1951). The Ordnance Survey Name Book (ONB 1852), erroniously stating that it was extant during the regency of Mary of Guise, (16th century), adds that it stood at the NW corner of Queen Street (now -i.e. 1974- Shore Place) underneath the old Shipping Company's office which was formerly supported by pillars, now built into its NE gable and no longer visible from the outside. Name Book 1852; J Grant 1901; RCAHMS 1951; Reg Magni Sig Reg Scot 1984. This building has been demolished to make way for the present Employment Exchange. Visited by OS (B S) 27 November 1975.